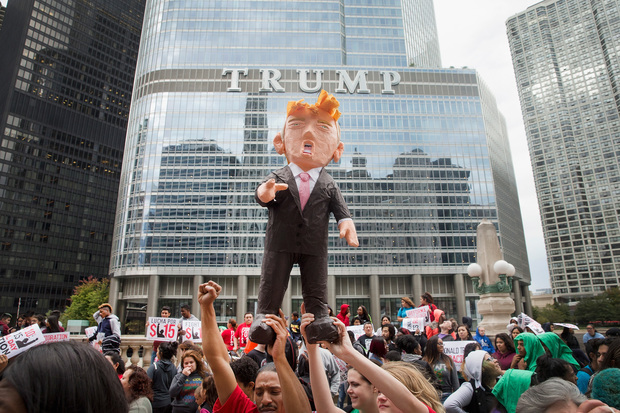 Demonstrators hold up a piñata of Republican Presidential candidate Donald Trump during a protest outside Trump Tower on October 12, 2015 in Chicago. About 250 demonstrators marched through downtown before holding a rally calling for immigration reform and fair wages in front of Trump Tower. Trump has been an outspoken proponent of a plan to deport undocumented immigrants. 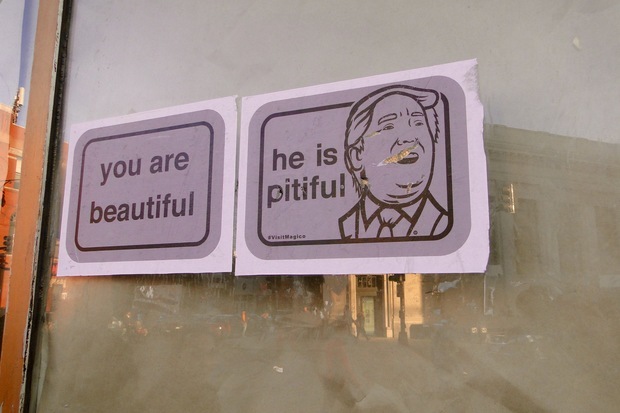 CHICAGO — Protesting Chicagoans got Donald Trump's Chicago rally shut down Friday, but even before he was running for office, the city has been notoriously cruel to the billionaire businessman. When the Trump Tower was constructed in 2008, its design was critically acclaimed. 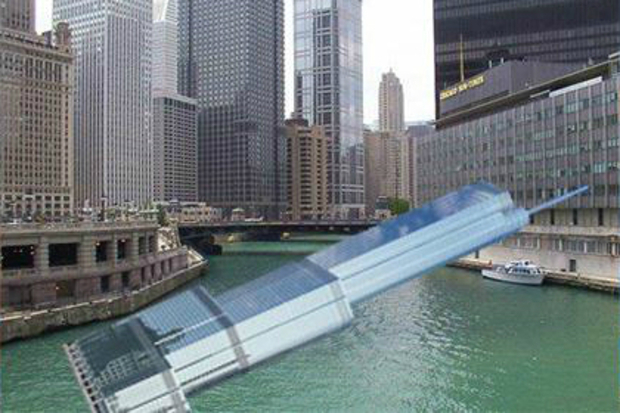 But in 2014 when Trump decided to add a massive sign to the Chicago River side of the skyscraper, things got ugly. 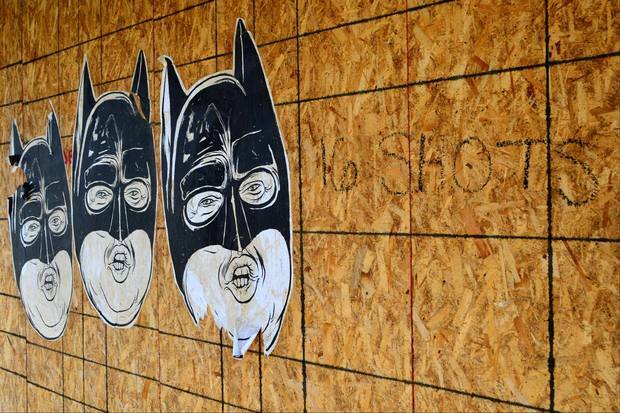 Mayor Rahm Emanuel joined aldermen, Pulitzer Prize-wining architecture critic Blair Kamin and other architecture writers in condemning the sign, calling it "architecturally tasteless," even though aldermen had approved it a year prior. Trump, of course, fired back. "Everybody loves it. We have people who just love it," Trump told NBC's Matt Lauer. "We're getting phone calls literally by the hundreds and thousands. Including tweets on Twitter." Ultimately, the sign went up. But Chicagoans didn't give up without a fight: City Hall passed an ordinance making it more difficult to put signs on Downtown buildings, and the sign was added to a "Chicago Disaster Tour," which also includes sites of the Eastland Disaster and the Battle of Fort Dearborn. Oh, and at one point some locals organized to push the Tower itself into the river. Though that didn't pan out. 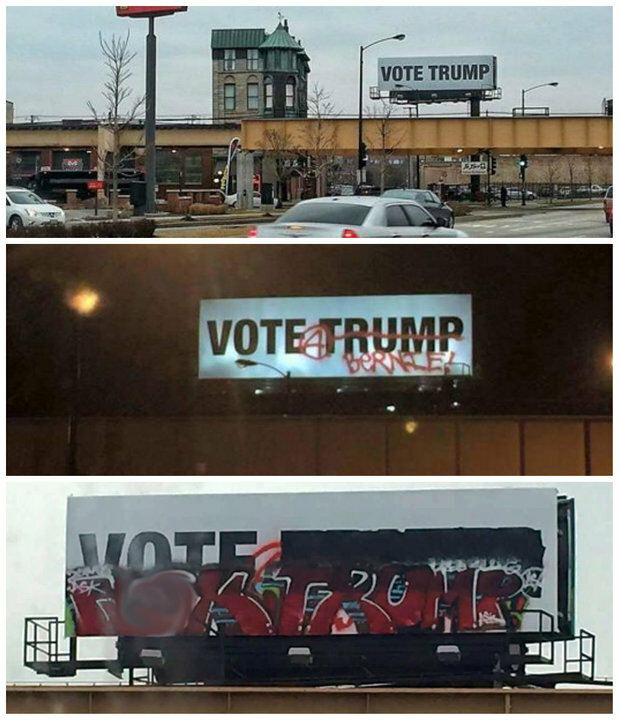 Last week, a large, white billboard declaring "VOTE TRUMP" was put up near Lake and Ogden. 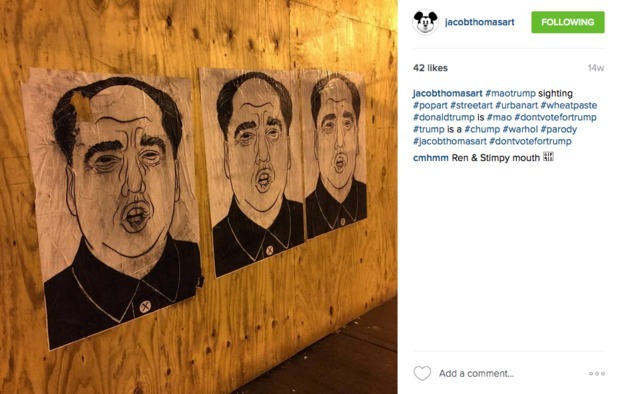 The billboard gathered attention after people shared photos of it and encouraged artists to paint over the pro-Trump message. It didn't take long: within a week the sign was vandalized twice and ultimately torn down. A fresh sign appeared Friday morning, so we'll see how long that lasts. When 5 Rabbit Cerveceria founder Andres Araya heard what Trump said about Latinos ("They're bringing drugs. They're bringing crime. They're rapists. And some, I assume, are good people.”), the brewery immediately severed ties with Trump Tower, killing a deal to produce a "house beer" for the hotel. 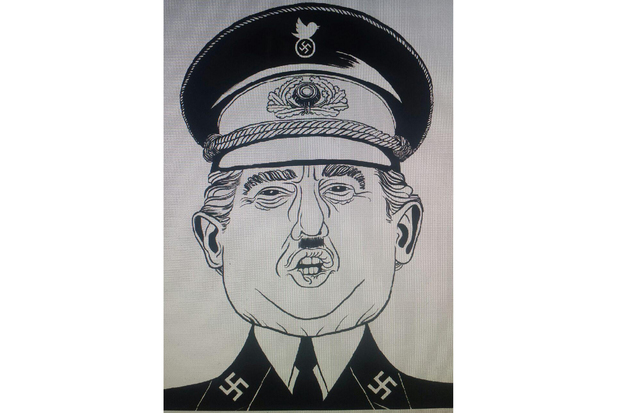 Then, they made a new beer dedicated to Trump: Chinga Tu Pelo (Mexican-dialected Spanish for "f--- your hair"), which will be served at the Bedford Park brewery Saturday. 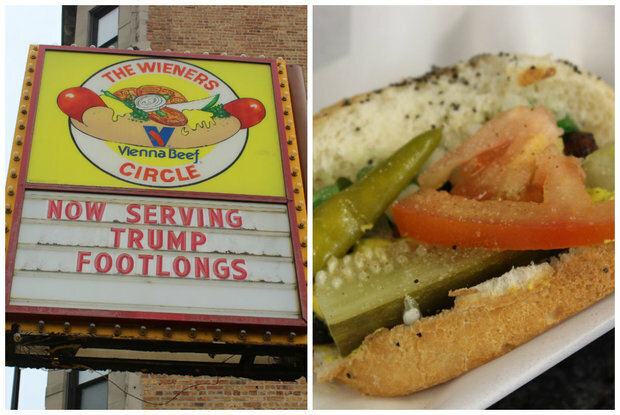 The Wieners Circle also got in on the action, announcing the sale of a 3-inch-long hot dog they've dubbed the "Trump foot-long." You can try one for yourself this weekend. Here are just a few examples from artist CHema Skandal and Jacob Thomas. 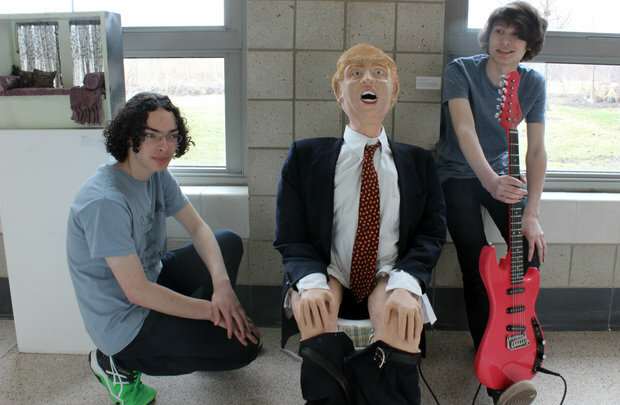 This Trump Toilet Built By Chicago Teens For Sale — Will Donald Buy It?